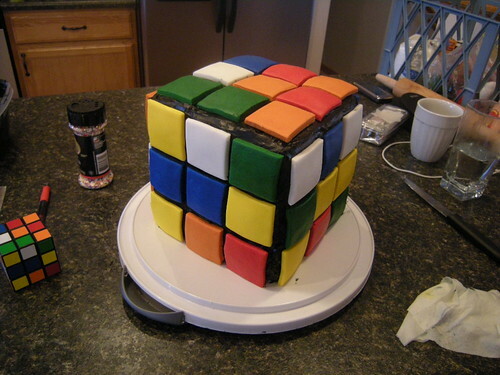 Like, can you solve this Rubik’s Cube (cake)? 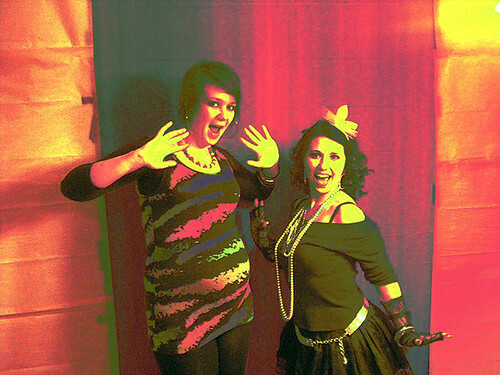 My friend Ashley had a totally awesome 80’s birthday party this weekend. She asked me to bring some ’80’s clothes and accessories (because I regularly rotate leg warmers and giant hoop earrings in my daily wardrobe, among other things). 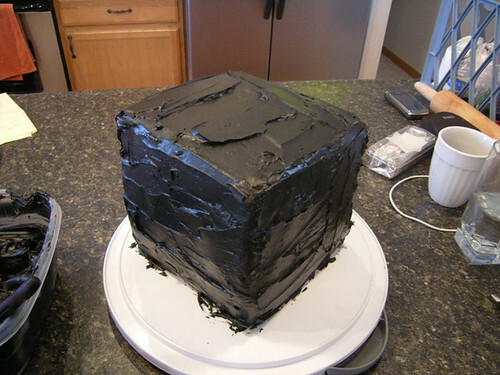 The she sent me a link to a really great 80’s Party blog and asked if I would make a Rubik’s Cube cake. 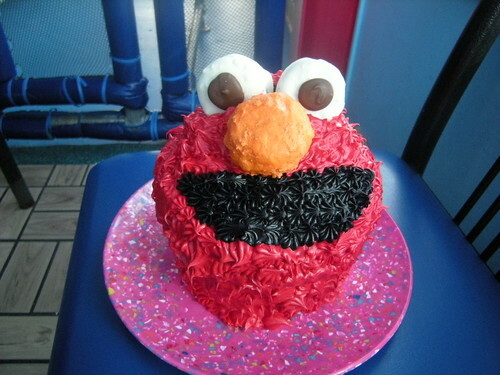 I’m still jazzed about the Elmo Cake, so I said yes. Now, Rubik’s Cubes are smooth. 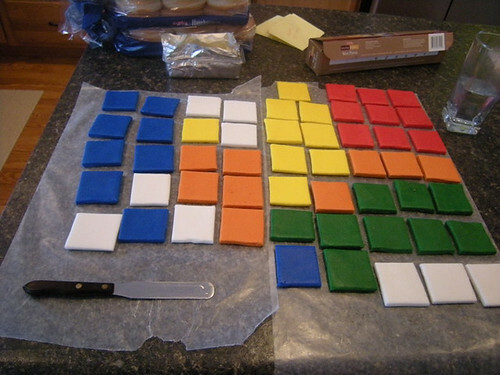 I didn’t want to just make use a frosting tip to make the colored squares; and I’ve been intrigued by fondant for a few months. Michael’s sells Wilton fondant, and I’d been sitting on a small package of it for a few months. This brick of fondant was not going to split six ways and into 56 tiles. 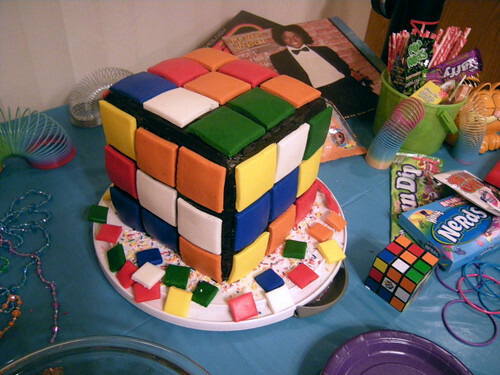 Once I saw the Rubik’s Cube cake, I started doing my own research. I kept going back to this website for ideas. The twisted layers look so fun! Tuesday was also the day I decided to make my own fondant. I used this tutorial to make it. The only ingredients needed were a bag of mallows, bag of powdered sugar, and some water. Also some Crisco for your hands. The instructions seemed too good to be true, but I tried it and it worked. Melt the mallows in 20-30 second increments in a large, microwave safe bowl. 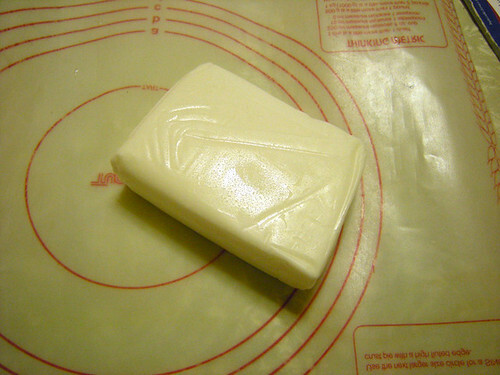 While melting, Crisco your counter (if your counter is porous, use waxed paper). When your mallows are all melted, add in a bunch of powdered sugar. Stir. By now it should be cooled down a bit. Pour on to your surface, dump more powdered sugar on, now is the time to Crisco your hands like crazy, be generous. Now play. I’ve never made bread dough, so the link above doesn’t really help me. 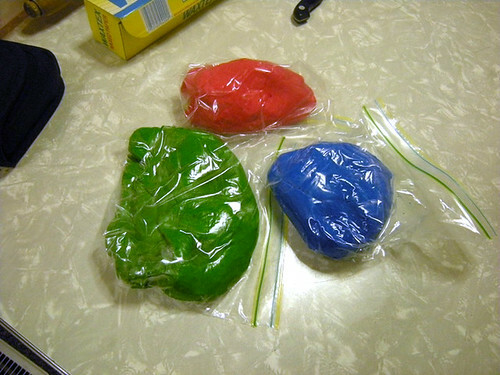 I more so just pretended I was 4 and playing with play dough. 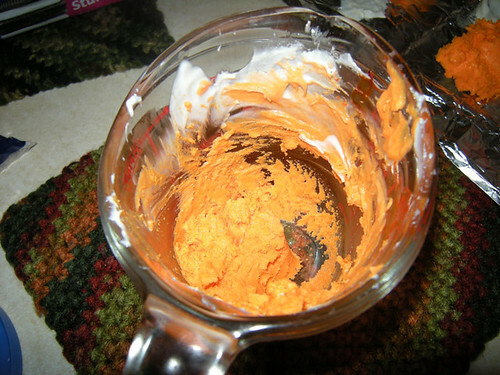 When it got sticky I would add more powdered sugar or wash my hands and re-Crisco them. Eventually it became the consistency I assumed it should be! 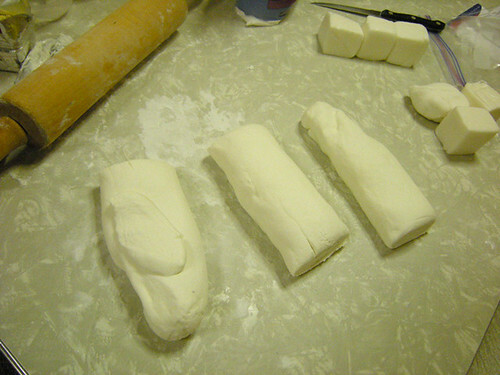 Fondant Logs. 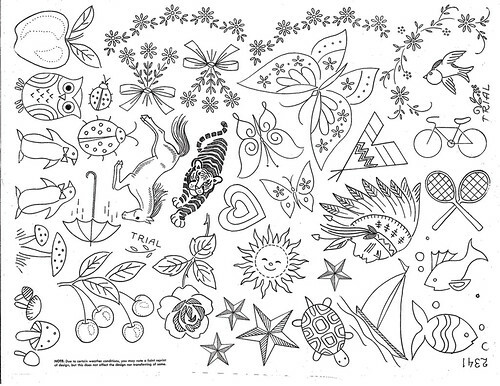 Ready for color. Three colors finished. Used liquid and gel food coloring. There is officially no more red gel coloring in my house. Also, they really peaked in color after they had sat about an hour. The rest of the week was also spent in cake prep – making another small batch of fondant, coloring the remaining fondant into yellow and orange, baking cakes, mixing frostings. Ok – some of that I did ON Saturday – but I wouldn’t have wanted to do this entire project in one day. 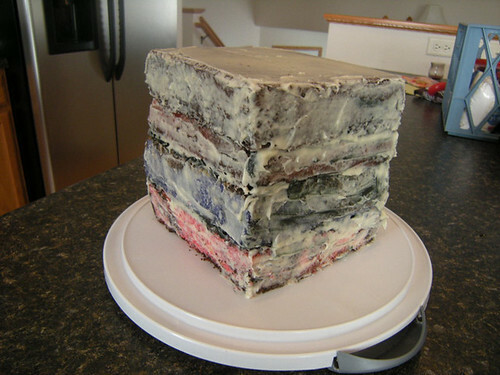 Yes, this is FOUR layers of cake, with a thin glaze to hold the crumblies in. Four layers? Zoiks. 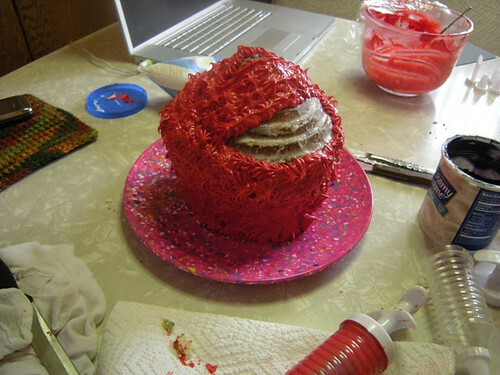 As you can see, I did not end up getting to twist one of the layers. I used this cute little 8×8 square pan. I completely overestimated how much cakes rise. Originally mixed a white box, and a chocolate box, and marbled it in the pan. I really thought it would raise more than it did. It turned out to be about half the height I wanted/needed. I also thought that two boxes would make three 2 inch layers. Not so much. So I ended up using four boxes of cake – trimmed the poofy tops, and slightly angled sides. Don’t worry about being perfect, that’s what frosting is for. Once I assembled the cake (above), I cut a piece of paper the size of the cake, then folded it in thirds, and thirds again. Now I have a tentative tile size. But the tiles don’t touch, I cut it smaller. It worked out perfect to cut a rectangle (think one row of color) out of waxed paper, then press that on the fondant for a shape to cut around. I just used a butter knife, but if your surface is protected, you could also carefully use a pizza cutter. I had a read a few discussions online regarding attaching fondant to regular frosting. I wanted the cake to actually taste good, so having an entire cake of fondant was not an option. You can easily attach fondant to fondant, but there wasn’t much about attaching fondant to buttercream. I knew that I did not want the cake to “dry” before trying to attach the squares, so that is why the squares were cut before I frosted it. Also read warnings about how if there are any imperfections on the cake that they would show through the fondant (any baubles or crumblies/chunks). That wasn’t so much the case – but perhaps it was just because my tiles were so thick. Maybe it shows through thin fondant? The cake is assembled! I tried to scrape the frosting off the plate, but knew that I would miss some. So I had a can of sprinkles and used the remaining tiles to hide the imperfections. Finished, on display on the cake/candy/toys table! I liked the idea of modeling the cake from an actual pattern on a cube. The squares attached PERFECT to the buttercream/canned frosting! I only had a sliding issue on one tile, but nothing major. Also, the general consensus of the party was that the homemade fondant better than the store-bought. Pretty jazzed that I could still fit into that dress; Ashley makes a great Madonna! Once I realized that embroidery didn’t have to be all flowers and cross stitch wall hangings that read “Home Sweet Home” I decided I should give it a try. 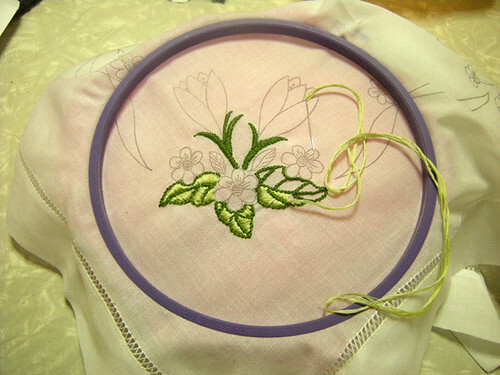 Tedious handwork is fun for me (the only thing I have patience for). Plus, I started seeing some really cute projects and wanted to do them too! The information page - explaining what to do! The Patterns! These shall be plastered over tote bags, tshirts, baby clothes, towels... you name it! Click on the photos to go to the Flickr page, you should see a bigger version. These are just all so cute! What should I make first?! Ok, raise your hand if you have a Big Top Cupcake mold and you LOVE it! 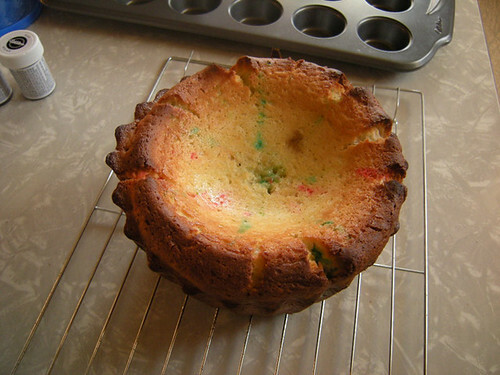 This was my first try at making a cake with the Big Top Cupcake mold. I offered to make a cake for my friend’s 2 year old’s birthday. We decided on Elmo, white cake, almond filling. The silicone pans come with directions, but I definitely should have made a trial cake last week. I ended up making two full cakes from three cake boxes because the first cake just didn’t quite live up to standards. Also, 20 mini cupcakes. I didn’t fill the molds enough on the first two. They definitely needed to be filled more than 2/3 full. The first cake. Not impressive. Not enough dough in the mold, too dark on the corners, and weird area of not cooked. Must try again. Success! A top and a bottom, with a thin layer of glaze to hold all the cumblies in - Altho, this wasn't too crumbly! 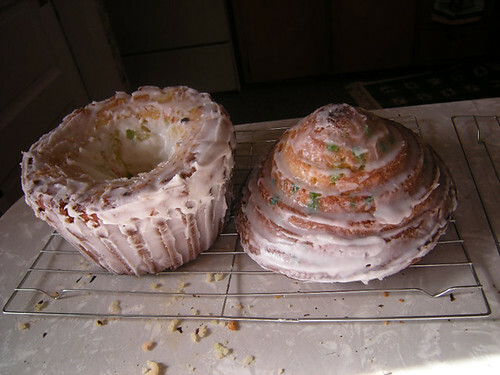 I was very proud of the glaze – used Crisco instead of margarine, powdered sugar and milk. So, I wasn’t sure if should use the Crisco, but when my mom came over to help, she assured me that it was fine. Also, that a lot of people use that instead of margarine or butter, and I felt better. I bought some to make some Christmas cookie… when else am I going to use Crisco?! I need to use it up! Elmo needs eyes, and a nose. Elmo has giant eyes, right? Well, frosting wasn’t going to do it. Those eyes needed height – almond bark covered Oreos (not pictured: I melted a tiny bit of chocolate for the pupils). He also needed a nose. So, I don’t know if I burnt the almond bark, or if it just didn’t like orange food coloring. 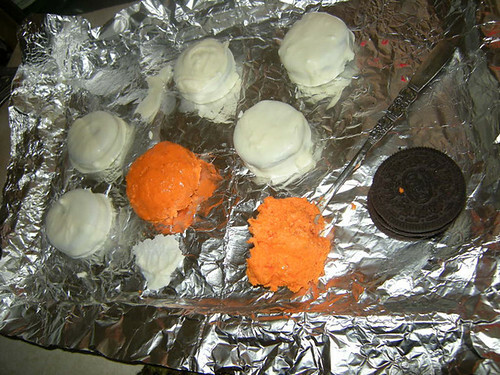 Instead of dipping the Oreo, I just kinda molded it to the cookie, and made it round on top. Then I made sure to tell everyone not to eat his nose due to the questionable nature. Close up of the orange almond bark madness. 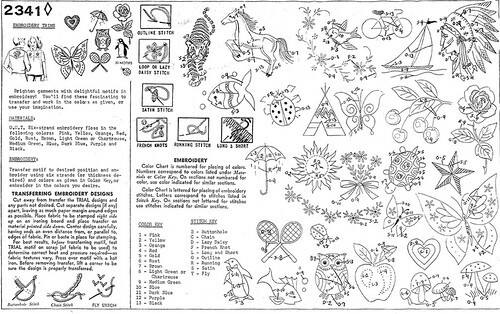 Next time I need colored bark, I'm just going to spring for the Wilton candies. Almost there - his fur is done, a little matted in places, but what can you do? He's a Muppet! I probly shouldn’t have started with him as my first Big Top Cupcake, as I have no idea how to top this – but I do have at least two more cakes to make every month for the next like 4 months. Confession: I didn’t make this, my husband did. It was delicious. He did an awesome job. Brian had been talking about this recipe for like a month before he finally made it. He started at 4 in the morning. The log of greasy goodness was done way before I woke up! He suggests serving it with scrambled eggs. I would also recommend pancakes and French toast, but mostly because I love them. Take weave of bacon, lay flat on cookie sheet/tinfoil. 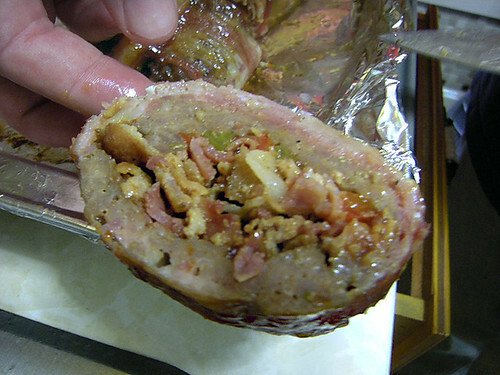 Flatten sausage over the weave. Spread BBQ sauce and season to your liking. Lay pepper slices and bacon crumbles on top of sauce. 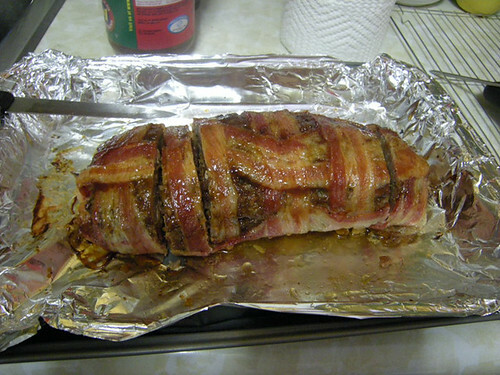 Carefully roll the MEAT into a log, with the weave on the outside. Have the seam on the bottom. Coat the log with more BBQ and seasoning, to taste. Cook 2.5 or 3 hours, use a meat thermometer to test. You want the meat around 165°. Slice of explosion - notice the deliciousness. The creative juices are flowing… just no output. This is the first time I’ve really MOVED, and I didn’t realize how time consuming it would be to put all of my stuff away! It probably doesn’t help that on top of getting organized, I seem to be acquiring more and more stuff. Apparently Babies do that to you. I’ve already sectioned off a portion of my living room that will undoubtedly be devoted to TOYS for the next … 10 years. I can’t say that I’m not excited for the Lego Mania that is bound to happen in my living room. Also, I’ve got lots of stuff. Every time I get three totes put away, I go back to Mom and Dad’s house and pack up three more totes! Who knows what they are going to do with all their extra space! So, here we are three weeks later and the only thing crafty I’ve done is make potholders – granted, they are awesome – Oh, and paint my craft room. Three of four walls are painted, the fourth may or may not be painted at a later date. Yellow, green and teal. If that doesn’t satisfy your room decor needs, click on the photo to go to my flickr account, do some browsing and you’ll find the originals. On the right is walls 1 (yellow) and 2 (green) with totes of fabric and plastic bags (Man to build shelves in closet soon); middle photo is a cool book shelf shoved in a couve; the photo on the left is walls 2 (green) and 3 (teal). These photos don’t do it justice – the bright colors will be very inspiring in months to come! More about the middle photo: I had all intentions of putting my television on this shelf, but I just don’t think that is going to work. It will have to be housed on another stand, in another corner. All of my craft stuff (beads, sequins, feathers, trims, biased tape, paint, tools etc) had just been thrown in to a giant tote and a giant plastic bag. I bought twenty 6 qt Sterilite storage containers from Walmart and separated everything into it’s appropriate category. And of course, as any good crafter would have, the multiple containers of “What in the world am I ever going to do with this/I can’t get rid of these doll glasses, you never know when I will want them” crap. So – there’s half the storage in this shelving unit 🙂 Above those are patterns, more bead/button/embroidery organizers etc; the top shelf is books/magazines. Not pictured: the closet that will (eventually) be housing all of my fabric/recycled clothes. Altho I haven’t been crafting, I’ve been cooking and doing some light baking. One of my goals for 2010 is to try one new recipe a month. January was a success, as I did two and Brian did one. Let me introduce you to: Orange Chicken. This is a recipe is from the Diamond Jo Casino Employee Cookbook (Northwood, IA). My changes [following the original]. You might also want to make some rice! I recommend remembering to make the rice BEFORE the rest of the food is done cooking. Goes a lot faster. Spray 9x3in glass baking pan. Place chicken, onion, peppers in dish. Mix sauce together and pour over chicken. Bake, covered, for one hour at 350. This is a Weight Watchers recipe. You will need a good sized pan. The big-ish one. I don’t know what they are called. But you’re throwing all the ingredients in together and they all need to fit and cook. Cut onion and peppers into whatever size you like to eat. Cut chicken into bite size pieces. Mix sauce together. Will be thickish, shouldn’t be runny. If you like your onion clear, start cooking them in the pan for a few minutes before adding the chicken and peppers – add some sauce so the onions start cooking in the sauce. 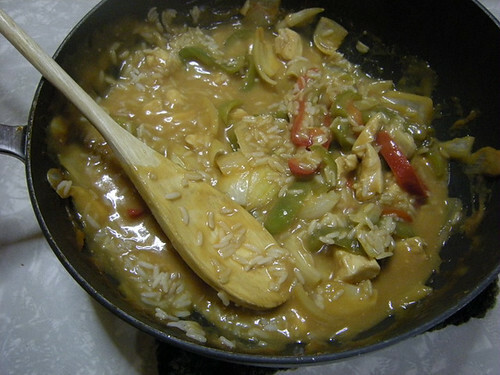 Add remaining ingredients (chicken, peppers, remaining sauce). Cover. Set your stove to medium to high. Check periodically should be done when everything is cooked. You want to give the sauce enough time for all the flavors to mix, it definitely tastes better at the end than when you mix it together!